This solidus struck under Irene reports the legend BASILISSH, Basilisse. Irene of Athens (Greek: Εἰρήνη ἡ Ἀθηναία; c. 752 – 9 August 803 AD), also known as Irene Sarantapechaina (Greek: Εἰρήνη Σαρανταπήχαινα), was Byzantine (Eastern Roman) empress from 797 to 802. Before that, Irene was empress consort from 775 to 780, and empress dowager and regent from 780 to 797. She is best known for ending Iconoclasm. Irene was related to the noble Greek Sarantapechos family of Athens. Although she was an orphan, her uncle or cousin Constantine Sarantapechos was a patrician and was possibly strategos of the theme of Hellas at the end of the 8th century. She was brought to Constantinople by Emperor Constantine V on 1 November 768 and was married to his son Leo IV on 17 December. Although she appears to have come from a noble family, there is no clear reason why she would have been chosen as Leo's bride, leading some scholars to speculate that she was selected in a bride-show, in which eligible young women were paraded before the bridegroom until one was finally selected. On 14 January 771, Irene gave birth to a son, the future Constantine VI. When Constantine V died in September 775, Leo succeeded to the throne at the age of twenty-five years. Leo, though an iconoclast, pursued a policy of moderation towards iconodules, but his policies became much harsher in August 780, when a number of courtiers were punished for venerating icons. According to tradition, he discovered icons concealed among Irene's possessions and refused to share the marriage bed with her thereafter. Nevertheless, when Leo died on 8 September 780, Irene became regent for their nine-year-old son Constantine. Irene was almost immediately confronted with a conspiracy that tried to raise Caesar Nikephoros, a half-brother of Leo IV, to the throne. To overcome this challenge, she had Nikephoros and his co-conspirators ordained as priests, a status which disqualified them from ruling. As early as 781, Irene began to seek a closer relationship with the Carolingian dynasty and the Papacy in Rome. She negotiated a marriage between her son Constantine and Rotrude, a daughter of Charlemagne by his third wife Hildegard. During this time Charlemagne was at war with the Saxons, and would later become the new king of the Franks. Irene went as far as to send an official to instruct the Frankish princess in Greek; however, Irene herself broke off the engagement in 787, against her son's wishes. Irene next had to subdue a rebellion led by Elpidius, the strategos of Sicily. Irene sent a fleet, which succeeded in defeating the Sicilians. Elpidius fled to Africa, where he defected to the Abbasid Caliphate. After the success of Constantine V's general, Michael Lachanodrakon, who foiled an Abbasid attack on the eastern frontiers, a huge Abbasid army under Harun al-Rashid invaded Anatolia in summer 782. The strategos of the Bucellarian Theme, Tatzates, defected to the Abbasids, and Irene had to agree to pay an annual tribute of 70,000 or 90,000 dinars to the Abbasids for a three-year truce, to give them 10,000 silk garments, and to provide them with guides, provisions, and access to markets during their withdrawal. While this greatly improved relations with the Papacy, it did not prevent the outbreak of a war with the Franks, who took over Istria and Benevento in 788. In spite of these reverses, Irene's military efforts met with some success: in 782 her favoured courtier Staurakios subdued the Slavs of the Balkans and laid the foundations of Byzantine expansion and re-Hellenization in the area. Nevertheless, Irene was constantly harried by the Abbasids, and in 782 and 798 had to accept the terms of the respective Caliphs Al-Mahdi and Harun al-Rashid. As Constantine approached maturity he began to grow restless under her autocratic sway. An attempt to free himself by force was met and crushed by the Empress, who demanded that the oath of fidelity should thenceforward be taken in her name alone. The discontent which this occasioned swelled in 790 into open resistance, and the soldiers, headed by the army of the Armeniacs, formally proclaimed Constantine VI as the sole ruler. A hollow semblance of friendship was maintained between Constantine and Irene, whose title of empress was confirmed in 792; but the rival factions remained, and in 797 Irene, by cunning intrigues with the bishops and courtiers, organized a conspiracy on her own behalf. Constantine could only flee for aid to the provinces, but even there participants in the plot surrounded him. Seized by his attendants on the Asiatic shore of the Bosphorus, Constantine was carried back to the palace at Constantinople. His eyes were gouged out, and he died from his wounds several days later. A solar eclipse and darkness lasting 17 days were attributed to the horror of Heaven. Irene's unprecedented position as an Empress ruling in her own right was emphasized by the coincidental rise of the Carolingian Empire in Western Europe, which rivaled Irene's Byzantium in size and power. Charlemagne invaded Italy early on in his reign, annexing the Lombard kingdom of Italy. He also campaigned against the Saxon tribes in northern Germany for more than thirty years, annexing their territory and compelling them to convert to Christianity, and defeated the Avars in Central Europe. In the Iberian Peninsula, Charlemagne's expedition against al-Andalus led to the creation of a buffer zone between Francia and the Islamic world called the "Spanish March". Charlemagne also increasingly modelled his rule after Roman Emperors by sponsoring enormous construction programs, exemplified by the building of his favourite residence at Aachen (in modern-day Germany), standardizing weights and measures and supporting intellectual and artistic endeavors in the Carolingian renaissance. Moreover, Charlemagne issued laws called "capitularies" in the style of a Roman Emperor. In 800, Charlemagne was crowned Emperor by Pope Leo III on Christmas Day, 800. 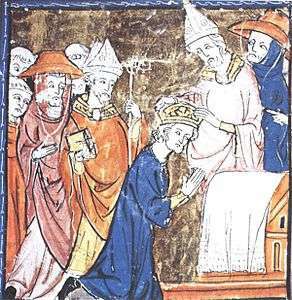 The clergy and nobles attending the ceremony proclaimed Charlemagne as "Augustus". In support of Charlemagne's coronation, some argued that the Imperial position was actually vacant, deeming a woman unfit to be Emperor. However, Charlemagne made no claim to the Eastern Roman Empire. Whether he actually desired a coronation at all, remains controversial - his biographer Einhard related that Charlemagne had been surprised by the Pope - but the Eastern Empire felt its role as the sole Roman Empire threatened and began to emphasize its superiority and its Roman identity. Relations between the two Empires remained difficult. Irene is said to have endeavoured a marriage alliance between herself and Charlemagne, but according to Theophanes the Confessor, who alone mentions it, the scheme was frustrated by Aetios, one of her favourites. Refusing to recognize Irene's reign, Pope Leo III crowned Charlemagne as Holy Roman Emperor. Irene's zeal in restoring the icons and monasteries made Theodore the Studite praise her as a saint of the Eastern Orthodox Church, but she was not canonized. Claims about her supposed canonization are mainly from Western sources. Such claims are not supported by the Menaion (the official liturgical book providing the propers of the saints of the Orthodox Church), the "Lives of Saints" by Nikodemos the Hagiorite, or any other relative book of the Orthodox Church. By her marriage to Emperor Leo IV the Khazar, Irene had only one son Constantine VI, whom she succeeded on the throne. A female relative of Irene, Theophano was chosen in 807 by Emperor Nikephoros I as the bride of his son and heir Staurakios. An unnamed female relative was married to the Bulgar ruler Telerig in 776. Irene also had a nephew. Wikimedia Commons has media related to Irene. Barbara H. Rosenwein, A Short History of the Middle Ages, second ed. (Toronto: University of Toronto Press, 2014), 80, 98-99.